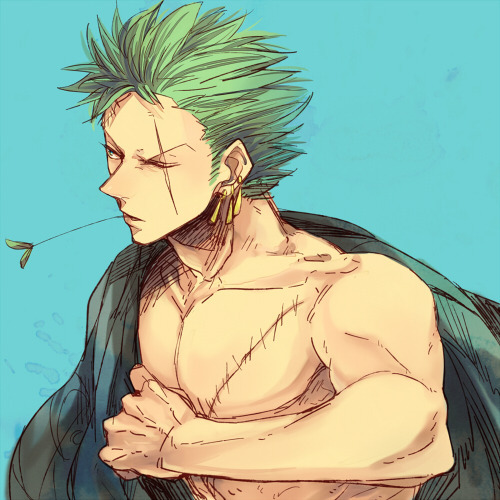 I follow Zoro as a natural hunter. Zoro holds my chain and leads me to hunt with him. Yes I believe so I say to him. You should rest I tell him. I shake my head no and keeps walking until we come up to a tree with fruit in it. I then kick the tree hard as the fruit falls down from it and I catch it in a basket. "There now we can go back to the ship." mumbles as my wound still drip blood. Get on my back or I'll drag you if I have to I say to him growling. I grab him and drag him by force. "OI LET GO!" yells as I cough out some more blood. I drag him back to the ship and pull him on to it. Grumbles as I start to get dizzy. I drag him up to Chopper. I grab Chopper's doctor stuff and give it to him. Chopper:"Thank you." he says and starts cleaning my wounds and bandaging me up as I was passed out. I help as much as I could being a wolf I really couldn't do much. Chopper:"He has been poisoned badly,but he will be fine." I lick Sanji's hand whining. I hope your right Sanji I say to him still whining. Sanji:"Oi stop worrying he'll be fine trust me I've known him a lot longer than you." he replies and walks to the kitchen.